Sport Clips aim is to “create a championship haircut experience for men and boys in an exciting sports themed environment”. Visit Sport Clips to enjoy their MVP Experience which includes a precision haircut, invigorating scalp massage with Tea Tree Shampoo, a classic barbershop-style hot steamed towel treatment. You can also enjoy a nice relaxing neck and shoulder massage.Sports Clips has been titled the Official Haircutter of the Veterans of Foreign Wars and offers veterans special pricing. Sports clips is also an honored sponsor for Joe Gibbs racing’s NASCAR drivers. Below are the latest Sport Clips prices. Sport Clips originated in Georgetown, Texas back in 1993 by Gordan Logan, Sport Clips has been ranked as one of the top 20 “Fastest Growing Franchises” and in the 10 percent of the “Franchise 500” by the Entrepreneur Magazine! Sports Clips MVP service package is only $23.00 while the Triple Play package is $21.00 inclusive of haircut, steamed hot towel treatment, and tea tree shampoo massage. Get precision haircuts with the Varsity package at $18.00. Sport Clips prices for Senior Varsity (55 and over) and Junior Varsity packages (12 and under) start at $16.00 and $14.00, respectively. 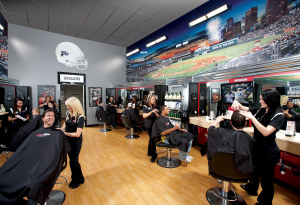 Sport Clips has been an up and running Salon and has been recognized for it’s efforts. In just 20 minutes, you can walk out of Sport Clips looking more macho than ever! Theri trained experts will ensure that you have a great time, and will guarantee, that you’ll walk out looking more confident than ever! What’s more? Sport Clips won’t charge an arm and a leg! With very reasonable rates, enjoy the service that you truly deserve.